While those two things can go together, today they were separate projects. I finally had an afternoon when I could get to the dairy farm and get more raw milk. In addition to the queijo fresco, I had a kit for making mascarpone which I wanted to try. So I purchased 2 gallons of raw milk and got started as soon as I got home. 1 gallon of milk went straight to the queijo fresco - and I used a new, metal, cheese mold which my friend had purchased in Brasil for me. Then I set up the mascarpone. The recipe calls for light cream but I thought that I could use raw milk instead. 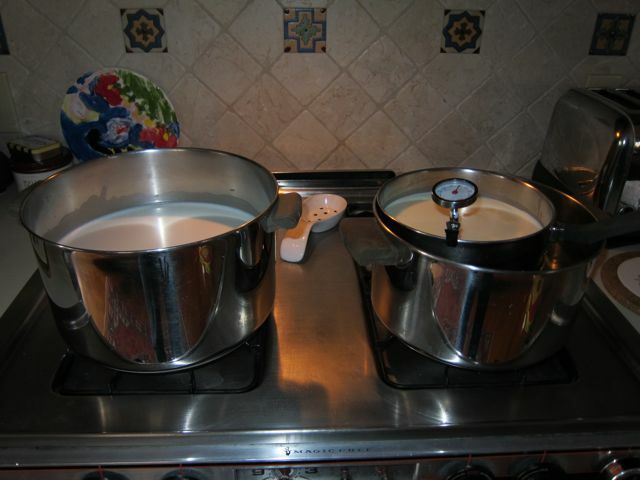 The milk was heated to 180 degrees and then I added tartaric acid and let the curds separate from the whey. After 2 minutes the curds were strained in butter muslin and the resulting cheese was stored when it was fully strained. It seems a little bit more rubbery than I would have thought, so I will try again with light cream to see what, if any, differences exist. Before the q ueijo fresco was ready to be packed into the mold, I made a pie crust and tossed in 3 pints of apple pie filling. 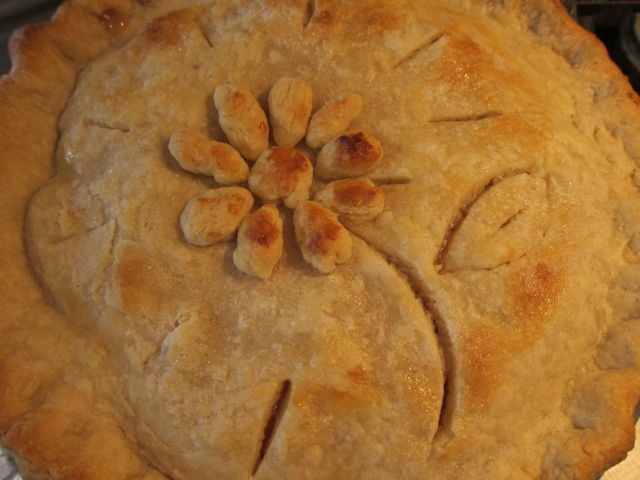 (The last time I made one, I used 2 pints, so I wanted to see if 3 was a better amount for a 9-inch pie.) In honor of spring this one is decorated with a flower. The 9-year-old is having a hard time staying away from it until dessert! While the pie baked, I made the queijo fresco and got it into the fridge. We're going to have a lot of cheese for the next few days. But I suspect it will get eaten rather quickly! Can we get pics of the cheese mold and resulting cheese?